We arrived in Guilin after a comfortable and enjoyable 8 hour high speed train trip from Hangzhou. Guilin as a city and travel destination is easily forgotten ... it's just another hectic Chinese city. What we won’t forget is the outstanding service we had from the hotel we stayed at, Hang Tang Xin Ge Hotel. We were here for 2 nights and the service we received was outstanding. From the pickup at the station, the check in, to advice on sightseeing. We had the pleasure of being assisted by Shower (Lan Xuehua) and her colleagues. They met the transport, assisted us with our heavy bags and couldn’t do enough to help us. It was rare today and from our service experiences in China … very rare. The hotel was slightly out of the main city and there was a limited choice of restaurants nearby. But the one supper we had outside and the one in the hotel were both delicious and reasonably priced. We did very little sightseeing while we were here. My wife and I spent a few hours walking around the Seven Stars Park. It was a breeze with discounted tickets arranged by Shower and her detailed instructions of which bus to catch and how the system worked. At the end of our stay she organised for us to get dropped off at the station for our bus trip to Yangshuo. In summary Shower is an unforgettable service gem – unique, dynamic and gracious. Yangshuo is situated about an hour south of Guilin. 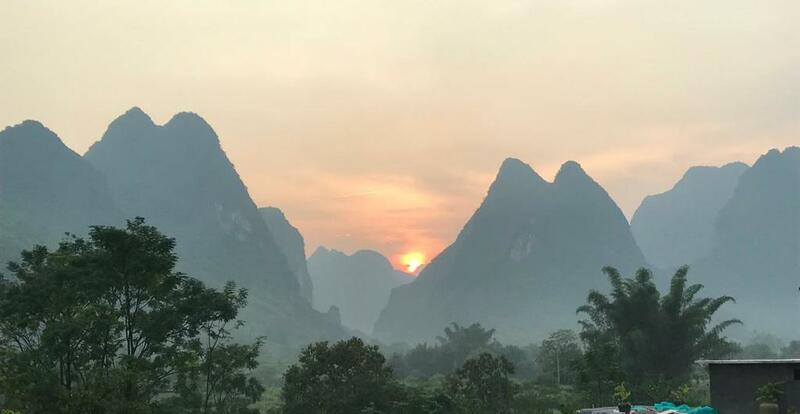 Yangshuo County is a county under the jurisdiction of Guilin City, in the northeast of Guangxi Province bordered on one side by the Li River. Here we stayed at the Ecofarm Lodge (Xiangxia Renjia Huayuan Hotel) located in a scenic valley of karst mountains close to the Yulong River. The mountains in this area have many easily accessible climbing locations and a number of well-known and challenging climbs. It is a delightful family run hotel. From the initial contact with Peter (the owner) from the bus depot in Yangshuo to him dropping us off at Guilin North Station the stay was excellent. Many of the vegetables are grown on the farm and the food is freshly prepared and delicious. Although we were very dubious about our first Chinese breakfast - rice congee, rice noodles with vegetables and a boiled egg - it was delicious (although we did add some sugar to the congee!). Over the few mornings we had delicious fried eggs, toast and yogurt and were introduced to sticky rice cake (an unusual texture but tasty). There are numerous paths around the area suitable for walking or very gentle and easy cycling. We had an interesting cycle where we didn’t check the map too carefully and ended up across the river. After some muddy single track, we were faced with another very rocky section and opted for a bamboo raft trip across the Yulong River!! The rooms were very comfortable and had a stunning view over the mountains. This was definitely one of the highlights of our China trip and we are glad we had 4 days here to enjoy the surroundings, the hospitality and the food.